Buyers have signed on and placed deposits for 16 units at One River Point worth $25,874,762 in the past 30 days, according to broker Michael Light. On average each of these units sold for $1,617,000. 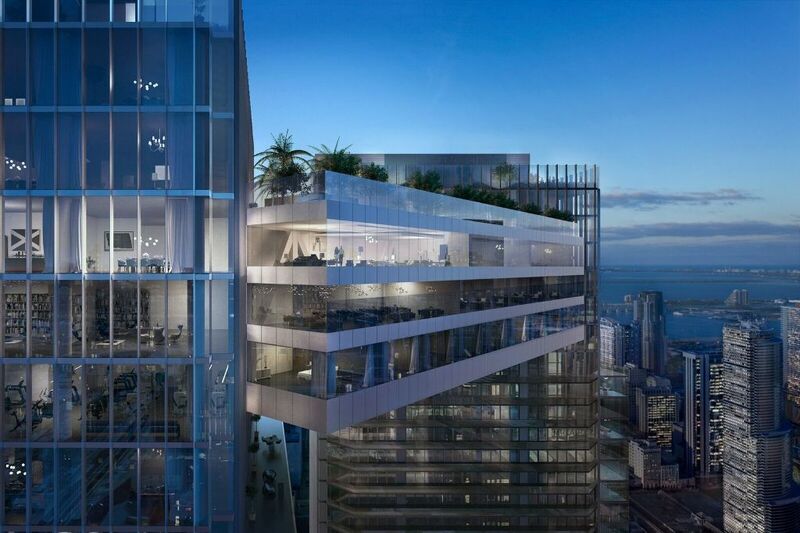 In total, about 100 of 386 units (26%) at the twin tower project are now in contract. Conversion to contract is now planned for November 2016, with groundbreaking in 2Q 2017. Really hope this actually gets built. It will add a very cool element to the Miami skyline. Will this even show up in the skyline? I am impressed. From the get go I always thought their price point was too high and their location is only secondary. Maybe I was wrong. Time will tell, but this market may have more legs after all. cant wait till they default on the construction loan so I can scoop it up and own this thing for bupkis! Default is not likely due to usable buyer deposits and a very strong guarantor who will provide the completion guaranty. This deal will either happen due to actual sales, or it will stall until next cycle when they can actually move units. They are an experienced group and won’t build without a full capitalization. Lenders and equity partners will not close unless buyer deposits are in-place and the basis is strong from their standpoint. Lots of new defenses from a lending standpoint this cycle so we don’t have another 2008. However, to your comment, maybe we can pick up units here after they deliver for a steep discount from pre-sales! Experienced group? These guys have never built anything here…nothing…ever. He’s just a rich guy that thinks he’s a developer. This is going to be as bad as the Paramount train wreck. You obv. do not know what you are talking about…google the developer shahab karmely and greenwich new york where he got foreclosed out. He has never developed a project of this magnitude…dan loeb of third point is the equity…billinaires have do much money their cost of equity is low. Especially right now. Market will be dead by the time they stick a shovel in the dirt they will run into big trouble with the deposits. This could not have come out at a better time to align with your comment SUZY. Did you know mechanics liens take priority over first mortgage draws if said draws come AFTER the mechanics lien is filed?…of course you do not know that. Your short, baseless and non-substantive comments reveal your ignorance…read the suit ^^^. And it begins….! Great addition to Miami’s skyline. typical BS from developers and brokers…bet you they haven’t sold anything. this job will stop soon. It is a bleh location and it does seem to be a huge amount of inventory and extreme price point, so I wouldn’t be surprised if this was a fake number. Is there no official public way to verify? Auberge is in a similar (worse even? not sure) location and was maybe too lux for a corner a block from the crack Checkers. At least in this cycle. good thing the developes dont have any debt on any of their projects..makes me feel comfortable that this will get built! cant wait!